Marimo moss balls: the ultimate low-maintenance houseplant? Marimo moss ball: it is a ball, but it's not moss ... Photograph by bryansjs on Flickr. You want a houseplant that doesn't mind if you overwater it, needs absolutely no care and will look exactly the same six months in as the day you bought it? Let me introduce you to your new favourite, the marimo moss ball. I first encountered marimo moss balls back in January when James Wong wrote about them in his Observer column, and then heard more about them on my episode of On The Ledge podcast devoted to office plants, when Christopher Satch of The Sill brought them up. They're billed as a low-maintenance houseplant, and that they are: just stick your ball(s) in a jar of water in bright light and, well, that's it. That's right, a jar of water. No, this is not your conventional houseplant, with leaves, and a stem, and roots that sit in compost. And what's more - the name is completely inaccurate. 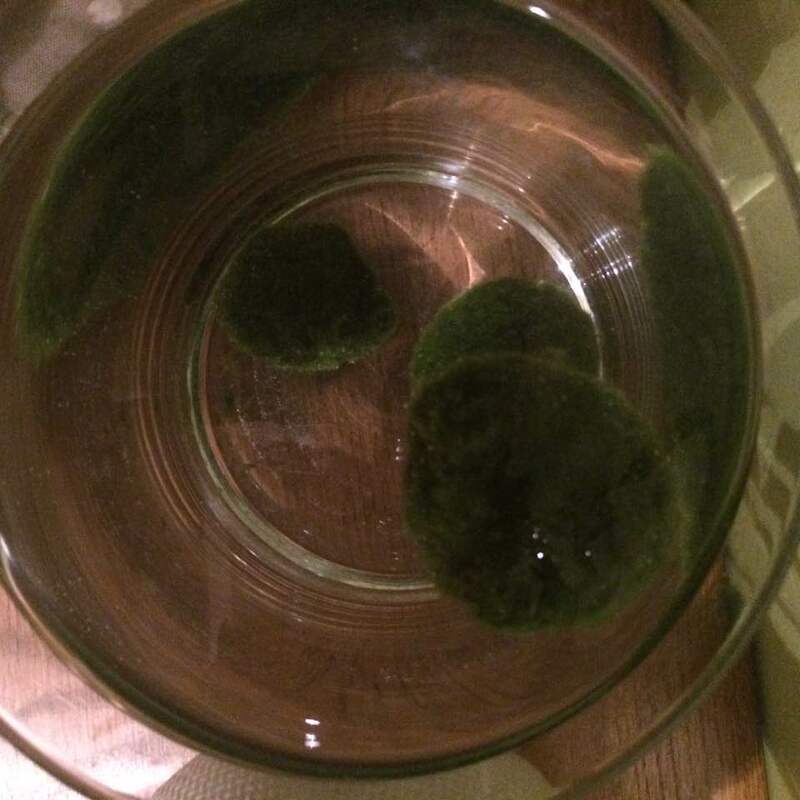 One up, two down... my marimo moss balls settling into their new home. Anyway, moving swiftly on. Intrigued, I decided to get some marimo of my own. I bought three largish balls on eBay, (they cost £3.99), but you can get them from various online stores and from aquatic specialist shops. They arrived in a damp plastic bag and initially took up residence in an old pickle jar, but now I've found a more salubrious home for them, as you can see in the picture above. If you have a fishtank (not goldfish though, they tend to tear marimo apart) you can use the algae that is the marimo moss ball to fight the kind of algae you don't want in your water. As James says, the advice is to use soft water but they seem to cope just fine with my hard-ish tap water. The advice varies on how often to change the water, but every few weeks should do. This site recommends washing your balls every so often, too, but that may be more necessary if they're in a tank with fish than if they're just in a jar on their own. And how do they rate as a houseplant? Well, don't expect the thrills-and-spills of an orchid or a Christmas cactus, but marimo are rather soothing - mostly the balls lay on the bottom, but occasionally, and seemingly inexplicably,* they rise to the top, like a natural lava lamp. My son was briefly fascinated and kept lifting the heavy glass lid, to cries of "CAREFUL!" from me, but the novelty seems to have worn off now. I really need to add some pretty stones and maybe some driftwood to complete the look. Although I can really see this plant working in a home where the owner is away for stretches of time, or wants something that looks good but is completely undemanding, I am not sure my marimo balls are going to steal my heart. They're soothing, yes, but ultimately algae just doesn't float my boat. *I have tried to find out why they rise and fall occasionally, but haven't found one - if anyone knows, comment below! What's all this podcast business anyway? If you haven't yet come across my podcast on indoor gardening, On The Ledge, check it out here... or subscribe on iTunes or Stitcher.